Summit comes to Fiona’s rescue in the nick of time, but it’s the mystery behind the men who attacked her friends (and the child’s parents) that ends up consuming Val’s attention. With the revelation of Lorena’s complicity in everything from the meteor on forward, Summit may be one of the few heroes in a position to stop her. There is A LOT going on in Summit #4. 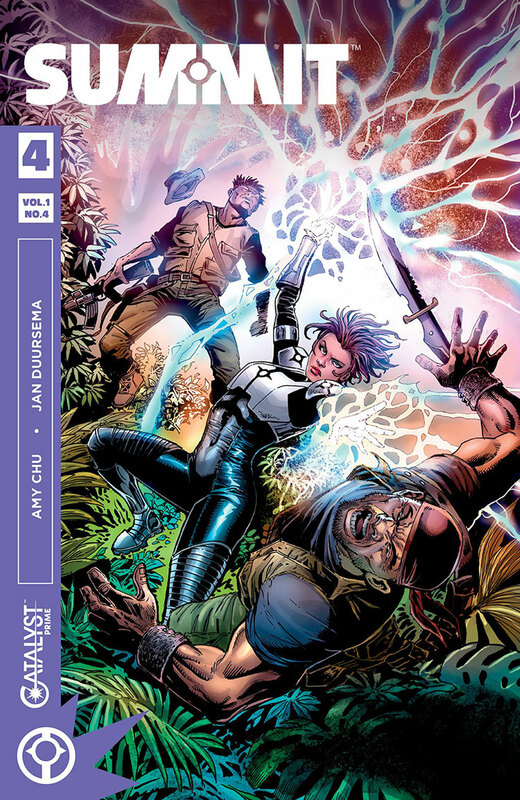 From the action of a jungle rescue to multiple revelations of bad faith and complicity at Foresight to a pseudo-explanation for how Val is able to control her powers — it’s a lot. And while every bit of it is worth digging into, and makes for a fascinating closure to the first volume of this series, I can’t help but feel short-changed. In essence, there’s not much room for any of it to breathe in this issue, and that’s a shame, because every bit of it is fascinating stuff. Between Noble and Summit, we have two titles that have given us a lot of facetime with the erstwhile anti-villain Lorena Payan. And every moment of that is time well spent. Lorena is possibly the best character find in super-hero comics in the last year, but I don’t think this issue did her complexity and depth any justice. Amy Chu definitely has put in the time on Valentina’s personality, thoughtfully constructing her cool demeanor as a fully-formed personality that feels unique and deep. It could have been easy to fall into the trope of the cold woman scientist, but the psychology and emotional expression Val conveys undercuts any simplistic wave of the hand. In just four issues, Chu has built a human. And it’s part of what makes this book so compelling. Lorena doesn’t have that depth here, or depth comparable to her appearances in Noble, and it makes for an uneasy narrative to watch Val pitted against a cardboard antagonist. Lorena’s attitude fluctuates widely between flippant and commanding, but she doesn’t feel like the mastermind she’s already proven to be. But what I wish there had been so much more room to explore is Val’s ability to deduce the underlying conspiracy that propelled her earlier rescue of Fiona. The scenes feel rushed, with key moments awkwardly transitioned, like when Lorena suggests a conversation about Nigel’s project and he immediately starts running out of the room. And then before any more discussion was had, he’s gunned down in cold blood. It feels crazily abrupt, even for someone like Lorena. And Val simply is unphased at all of it. It’s a pacing issue that doesn’t seem generated by Duursema’s pencils and layouts, which as in previous issues are quite simply stunning. In fact, it would be fallacy not to be clear about one thing: every bit of considerable energy and thoughtfulness Amy Chu has put into developing Val has been matched ounce for ounce by Duursema’s talented craft. Her ability to deliver a novice hero who can take control of any situation, despite its craziness, and come off as believable is a true feat. And nothing beats Duursema’s facial expressions for Val, which introduce so much subtlety to the book overall. Some of the other characters — particularly Lorena — suffer a bit by comparison, shining in the first few pages, but deteriorating a tad as the issue progresses. But overall, Summit remains one of the most solidly artistic books in the Catalyst Prime line, and frankly, on the stands in tota. The introduction of love as a motivator and what that means from a psychological standpoint for someone like Val who has deep emotions (but doesn’t express them as comfortably or physically as other people), is absolutely fascinating. So, I’m hoping that’s a significant portion of the next volume’s exploration, because it got very short shrift in issue #4. There’s so much to explore in Summit, that as a book it almost feels like a fusion reactor ready to blow in itself. My want is simply more time, more space dedicated to just about everything.